European leaders have found their nemesis in Viktor Orbán, whose legislation closing down the Central European University constitutes an ethno-nationalist and authoritarian challenge to Europe's liberal order. 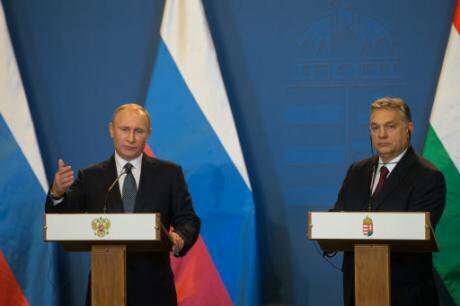 Vladimir Putin and Viktor Orban hold a press conference after their meeting in Budapest, Hungary, on Feb. 2, 2017. Xinhua/SIPA USA/Press Association. All rights reserved. If guests questioned the significance of a university to its founder, the former President and Rector of Central European University, John Shattuck, liked to remind them that unlike most human institutions, universities can boast longevity. Which significant institutions live on, he would ask, from the years of renaissance glory in Florence, Venice or Padua? Their universities. Or, to put the matter in more familiar terms, what other British corporation founded in 1421 survives and thrives 600 years on, as does King’s College Cambridge? But after yesterday’s news from Budapest, it may be that the distinguished diplomat and former head of Harvard Library, spoke too soon. At 12.30 yesterday lunchtime, the Hungarian parliament passed an amendment to its Education Bill which is expressly and solely intended to close the most successful university in Central and Eastern Europe. The act of parliament – now popularly known in Hungary as Lex CEU – has already provoked outrage across Europe and the world with hundreds of academics signing the main petition including 20 Nobel Laureates. It is to all appearances an act of self-harm, with both the European Commission for Culture – Tibor Navrocsics (a Hungarian government appointee, as it happens) and leading conservative Hungarian academics including László Lovász, president of the Hungarian Academy of Sciences, standing by CEU. According to Viktor Orbán, the Prime Minister of Hungary, talking on his Friday morning radio show, CEU has been ‘cheating’ the system. The new Act – the relevant clauses of which were published late on a Friday night less than two weeks ago and were then debated in Parliament this week in an accelerated procedure – re-establishes ‘the law’ that foreign universities operating in Hungary must have a fully operational campus in their home country. Something is wrong here in that CEU is both an institution domiciled in the State of New York and a fully accredited Hungarian University. At the time of the onerous and bureaucratically watertight Hungarian accreditation procedure – under Mr Orbán’s administration – no one noticed that CEU had been acting illegally. Some interpreters believe that Mr Orbán meant to say that since most of CEU’s master degrees are awarded after one year’s study (unlike most Hungarian Universities that demand two years [the UK has had exceptional status in Europe for many years]) CEU is competing unfairly (‘cheating’) against local competitors. But this does not make sense since those who are losing out in the supposed competition are not complaining. CEU has the best library in the region and allows Hungarian university staff and students to use it for free. The university maintains outstanding academic relations with its Hungarian neighbours who recognise it as the main site through which Hungarian higher education finds a window to the wider world. Numerous joint research projects are currently running and the university provides a welcome home to star Hungarian academics seeking a return home, like the world leading network scientist, Albert-László Barabási, inventor of the scale-free network concept or the world class team that lead cognitive science there. Now, it is famously difficult today to work out what the Hungarian government’s next moves are in any particular field. With a strangulated media, an enfeebled opposition and a political elite held hostage by an apparently unbeatable premier, analysts are reduced to speculating about the mental disposition of the erratic Mr Orbán. For what is certain is that nothing gets done by his government without his express permission. But there are reasons to think that the Hungarian government is seriously intent on wounding or even killing off CEU – at least in its Hungarian embodiment. Key to the issue is the personal and ideological antipathy the Hungarian Prime Minister and his circle bear to CEU’s founder, George Soros. Soros’ endowment of CEU – to the tune of over $880 million makes it Europe’s richest university and so a powerful and independent force. As a private university, moreover, its governance lies beyond Orbán’s famously meddling hands. Mr Orbán has proclaimed that he is building a European version of the ‘illiberal democracy’ championed by Vladimir Putin, Recep Erdogan and Lee Kuan Yew of Singapore. This represents the literal inversion of the Popperian Open Society that Soros’ NGO network and his university has championed and promoted. Mr Orbán’s vision is for a national ‘social’ democracy with a strong, interventionist state and open preference for ethnic compatriots in all public matters. Only a few days ago did Mr Orbán say he wants to see only Hungarians in Hungary. CEU, an institution with faculty from 30 countries and students from over 100 countries represents all that the Orbanistas disdain. Worse, with this profile and teaching only in English, the graduate-only university sits in the top 200 universities worldwide, with its best departments in the top 50. Not one of the Hungarian language universities today reaches into the world’s top 500. To a heartfelt ethnic patriot and passionate Hungarian nationalist this hurts. More, it represents a challenge to the very ideology he trumpets. While trumpeting at full volume their own anti-communism (many of Mr Orban’s economic policies are designed to ‘grab back from the communists all they stole from us’), the style in which they conduct politics smacks of nothing so much as the Bolshevik rulers of the region. Since 2010, Orban’s government has, inter alia, devised a law formally designed to lower top civil servants’ salaries to squeeze out the independent head of the National Bank; used retirement legislation to force out disloyal elder judges from the judiciary; through dubious financial manoeuvres closed overnight the leading opposition paper, Népszabadság; and through administrative pressure brought cultural institutions, local governments and even schools under the fist of the government. And now, just like the communists, they propose to shut down a university. Universities represent a last bastion of free thought in Hungary. And CEU sits on top of the pile. Indeed, it has been one of the sites where young thinkers from around the region have met, have talked together and have tried to work out how to take the transformation promised in 1990 through to its conclusion. The higher echelons of Ukrainian and Georgian civil services and political life have a disproportionate number of CEU graduates as do those of the former Yugoslav states. Three weeks ago Mr Putin shut down the European University in St Petersburg by executive order. He and and Mr Orban are famously close as thieves, though it is not likely that they have formally coordinated their moves. There is nothing wrong in principle with arguing against the liberal ‘open society’ consensus. There are powerful arguments against the rights-based discourse of justice and social policy that dominates at Central European University. But those arguments are to be had in the universities. It is not the business of governments to enforce administrative victories in these matters. Commentators have been worrying over a Le Pen presidency, but in Mr Orbán, the European Union has already met its nemesis. A revanchist, ethno-nationalist authoritarian is now openly challenging the ‘liberal values’ that the British prime minister extols at the heart of our continent’s modern history. It would be a tragedy for Hungary and the whole of European public life were Mr Orbán to win this battle. This article was first published on UCL European Institute’s blog, Analysis, on April 6, 2017. Note on transparency: George Soros established the Open Society Foundation and the Open Society Initiative for Europe, both of which are supporters of openDemocracy’s work.